Put on your dancing shoes and come on down for some classic soul grooves with Soul Power, a high-octane dance band featuring eleven Bay Area stalwarts, including a full horn section guaranteed to get your blood flowing and your feet tapping to all-time classics popularized by the likes of James Brown and Tower of Power, Wilson Pickett and Earth, Wind & Fire. 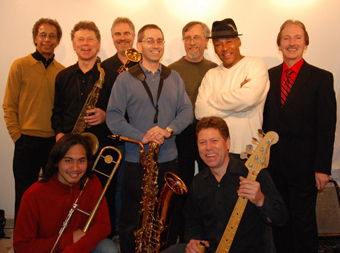 The band features Ian Willson on alto and tenor sax, Tommy Banks on lead vocals, Glenn Appell on trumpet, Robert Todd on baritone saxophone, Patrick Malabuyo on trombone, Rick Bailey on drums, Peter Fujii on guitar, Loren Linnard on keyboards, Scott Willson on bass, Don Beck on trumpet, and Rich Martin on guitar. If you haven’t tried out the Freight’s dance floor, this is the night to do it. Strut your stuff with Soul Power!